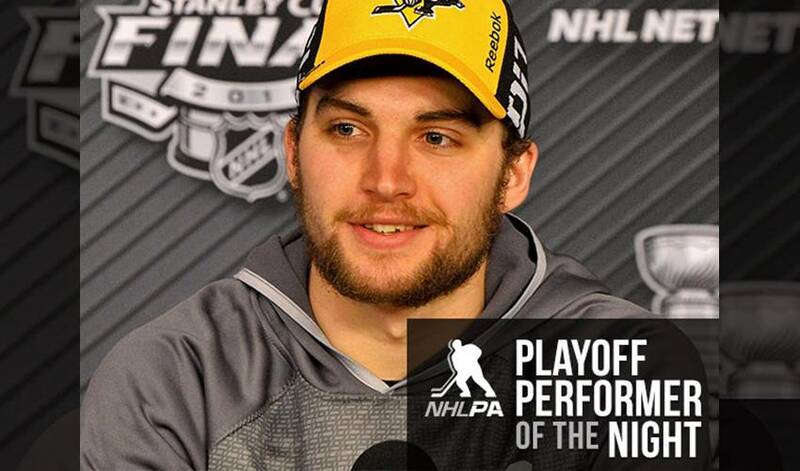 Conor Sheary is the PPOTN honoree after his winning goal in Pittsburgh’s Game 2 triumph over San Jose. The left-winger lit the lamp in overtime as the Penguins downed the Sharks 2-1 on Wednesday night. STAT PACK: Sheary had two shots on goal, was a plus-1, recorded one takeaway, and took 24 shifts in 15:59 of ice time. EARLY BIRTHDAY GIFT: Sheary’s OT winner came one week before he turns 24. BIRTHDAY BOY: Sheary shares a birthday (June 8) with rapper Kanye West, actress Julianna Marguiles, actor Jerry Stiller and singer Nick Rhodes (Duran Duran). EARLY CHRISTMAS PRESENT: Sheary scored his first NHL goal (and also added an assist) on December 18, 2015, against Boston. MY HOMETOWN: Sheary hails from Winchester, Massachusetts. Other notable people from Winchester include former NHL players Glen Murray and Jay Pandolfo, Brad Whitford from rock group Aerosmith and former MLB player Mike Pagliarulo. HONOURABLE MENTIONS: Phil Kessel had the other goal for the Penguins. Justin Braun scored for the Sharks.